Co-pilot who deliberately crashed Germanwings Airbus was a Muslim convert? Andreas Lubitz when he visited U.S.
Jim Hoft of Gateway Pundit writes, March 26, 2015, that according to Michael Mannheimer, a writer for German PI-News, Andreas Lubitz — the co-pilot who deliberately crashed Germanwing Flight 9525 into the French Alps, killing all 150 on board — was a Muslim convert. You should know that the U.S. Federal Aviation Administration has a “two person” rule for airlines that at any time while the plane is aloft, there must be at least two crew members in the cockpit. If, say, one of the two pilots leaves the cockpit, a cabin steward must accompany the remaining pilot in the cockpit. Europe and other countries do not have this rule. After the Germanwings Airbus crash, in which the captain had exited the cockpit, only to discover that co-pilot Lubitz locked himself in and refused to let the captain back into the cockpit. We know the tragic rest of the story. Happily, other countries’ airlines are now rushing to adopt the “two-person cockpit” rule, which means at least something good has come out of the Germanwings tragedy. See also “Germanwings Airbus crash: Co-pilot deliberately crashed plane; captain was locked out of cockpit“. This entry was posted in crime, Evil, Islam, Islamic State/ISIS/ISIL, Terrorism, Travel. Bookmark the permalink. Didn’t you just know it was only a matter of time before the “M” word came screaming out of the careful news cover-up about this atrocity? 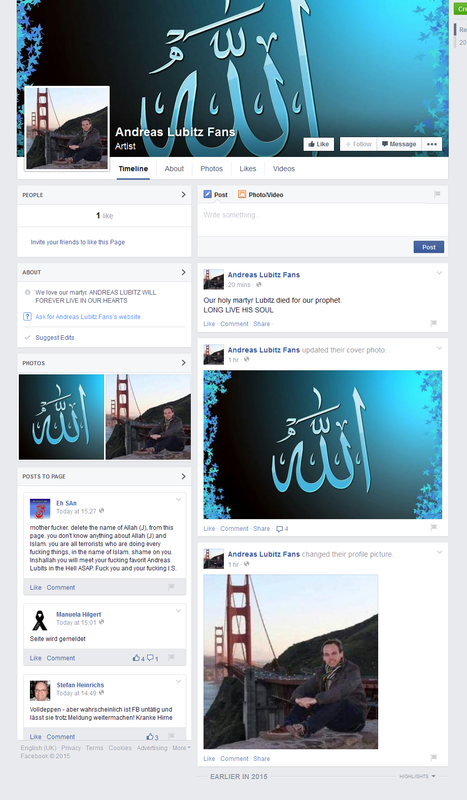 Was that actually his page, or a page created by a nutjob Muslim spitswapping pal on his behalf. Anyone know what the graphic means? It’s easy to buy into this theory, but let’s at least get our story straight before we let the genie out of the bottle and slaughter em all. Was it OK to say that? Did they find his beheaded fiancee yet? Just heard a CBC report from Germany that someone looked into his life more closely, and unearthed his MD’s recent finding that he was becoming ‘more unstable’, but was in excellent physical condition. His co- workers said he was lively and outgoing, right up to the last time they saw him board the plane he flew. I’d say that any one who hangs out at a mosque known to be radicalised is surely at least ‘more unstable,’ if not worse. Great article! Thank you, Dr Eowyn. Please keep us informed as more info regarding his radicalization becomes available. Josephbc69, the next to the last sentence, “he was lively and outgoing, right up to the last time they saw him board the plane he flew.” tells much of the delight he took in his religion. Thank you Dr. Eowyn for this important post. When I listened to the news about this horrible tragedy, there was no mention that he was an Islamic convert, which is an extremely important fact. Amazing! There are no words to describe the horror and evil of this event. He was a muslim!!!! Shocking!!! Flabbergasted beyond belief!!! Never thought in a million years, in a billion years, in a trillion years, that the perpetrator of this workplace accident could possibly be a muslim!!! No doubt this was yet another devious plot concocted by the Mossad to discredit the absolutely, totally, peaceful followers of the religion of peace. When secretive governments keep the truth from the public, the vacuum will be filled with stories more damaging than if the truth had simply been given to the public immediately. Hiding the truth is fertile ground for conspiracy theorists. I’m not ready to buy into the camel-washer angle just yet, but that is subject to change. As for the two persons in the cockpit rule goes, unless the flight attendant is highly trained in the martial arts, their chances of stopping a determined saboteur are exactly zilch. Most all of the newer airliners do not require a flight engineer, as they were historically the third person in the cockpit. Maybe certain airlines should consider putting armed security officers in the jump seats.